You get these top selling books in one bundle. How to maximize your success with money, your finances and your future. So how do the wealthy get rich? It’s not luck and it’s not that they had a better formal education or rich parents. For many it’s because they have they had a special “money education” and have learned the right way of thinking and they display “Rich Habits” every day. Learn the Science of Becoming Rich so you can enjoy the lifestyle you deserve. 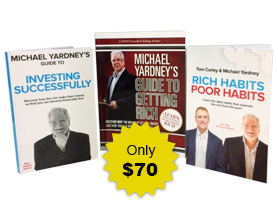 This book is your chance to get that special “money education” that you have always dreamed of having and get out of the daily rat race by developing financial freedom. It’s your opportunity to learn the real rules of wealth and money directly from someone who has made it and kept it. More importantly, this is your chance to learn from someone who has helped thousands of his students and clients build their own wealth — to the tune of over $2 billion in assets. WARNING!There are no get rich schemes discussed in this book — only proven strategies to fast track your financial success.